Autism in the national and local news. Health insurance has changed dramatically in the last year, with many companies, like Anthem Blue Cross Blue Shield and IU Health, leaving the individual market in Indiana. This means there are fewer choices for 2018 making it important to begin shopping early. The Affordable Care Act (ACA)’s open enrollment period allows individuals to enroll in a plan through the Health Insurance Marketplace. Any family who has a child with autism and wants access to therapy should have a healthy insurance plan covering ABA services. So, for those that do not currently have health insurance, or have group coverage not covering ABA Therapy, now’s the time to enroll. To obtain insurance coverage in 2018, you mus purchase a policy between November 1 and December 15, 2017. While you may purchase a policy anytime during this period, the earliest the plan will be effective is January 1, 2018. The good news is ACA plans are fully funded and are mandated to include coverage of autism services. Plus, it doesn’t affect the cost of the plan in any way. The Insurance Department at Lighthouse Autism Center has been working diligently with an insurance broker to identify plans that will most benefit families with autism. To learn more or inquire about purchasing a policy, you can contact Lighthouse Insurance Manager, Michele Rohyans, at 574-387-4313, or micheler@lighthouseautismcenter.com. Can Google find the cure for autism? Over the past 10 years, no disorder has become so familiar to Americans, yet remained so mysterious, as autism. Now affecting 1 in every 68 children born in the United States—up from 1 in 166 a decade ago—the condition has so far resisted nearly all efforts to cure it, curb it or even precisely define it. As a result, speculation and controversy surrounding the disease has mounted, leaving parents unsure what to believe and doctors frustrated with a lack of options. But an unusual partnership between science, business and philanthropy may soon provide some answers. Autism Speaks, Google and geneticist Dr. Stephen Scherer have devised an ambitious plan to upload the complete genomes of 10,000 autistic patients and their families to a cloud database that will be searchable, sortable and shareable with researchers around the world. The plan, known as the Autism Speaks Ten Thousands Genome Program—or AUT10K—aims to harness the combined power of big data, crowdsourcing and genetic know-how to isolate the causes of autism and find new genetic targets for treatment. If successful, the $50 million project could not only help doctors understand and treat autism but change the way illnesses are tackled in the 21st century. Already the project is paying dividends. Later this year, Dr. Scherer will be publishing a paper based on an analysis of the first few thousand genomes to be uploaded that shows, as expected, that autism consists of more than a single condition. This is big news for people struggling with autism, which has the unfortunate distinction of being a spectrum disorder—meaning it is characterized by a range of symptoms that may or may not stem from a singular cause. “A spectrum disorder is the kiss of death for pharmaceutical companies,” Wright said. “They’ll say to me, ‘That’s too much work; we’re not going to tackle that. '” While this first paper may not be enough to guide the production of new treatments, it is, by any estimation, a major step forward. Scientists have long believed that studying genes is the key to understanding disorders like autism, Down’s Syndrome and Alzheimer’s. By seeing which gene mutations are shared by people with a certain condition, researchers can isolate the causes of the disease and design drugs to treat it. But that is easier said than done. The complete human genome contains close to 25,000 genes and takes up about 100 gigabytes of storage—the equivalent of 10 high-definition movies—when uploaded to a computer. Storing, much less analyzing and sharing, all that information is far beyond the capacity of most universities and research institutions. Enter Google and its seemingly limitless computing capacity. About a year and a half ago, David Glazer, a Google engineering director in search for a new challenge, formed a team within the company to find life-science projects that could benefit from using its cloud platform, which was designed to store and analyze massive data sets. Autism Speaks, which had already been collecting genomes from patients and their families for 15 years, seemed the perfect fit. That the lead researcher for Google’s first life-science client should be Dr. Scherer makes some historical sense. His signature work greatly contributed to the massive increase in data now produced by many geneticists. In 2004, Dr. Scherer discovered a major form of genetic variation that researchers had previously overlooked. For decades, scientists had believed that all people were born with two pairs of every gene—one from their father and one from their mother. But using a new form of high-resolution scanning technology that allowed him to examine DNA more closely than ever before, Scherer and his colleagues found that people can have three copies of a gene, or one, or even none at all. Sometimes these copy number variants, as they are known, make no difference to a person’s development. Other times they lead to serious developmental conditions, such as autism. An Ontario native, father of two and avid hockey fan, Scherer talks about AUT10K as a dream come true for a scientist used to working—and sometimes straining—within the bounds of conventional research. Autism Speaks is not the only group pursuing a cure for a disease through large-scale genome sequencing. Earlier this year, the NIH awarded a $12.6 million grant to five American universities, including the Boston University School of Medicine, Columbia University and the University of Pennsylvania, to analyze whole genome sequences of Alzheimer’s patients. In 2011, the Mayo Clinic announced an effort to sequence the genomes of thousands of its patients; it later selected Complete Genomic to do the actual sequencing. Scherer and Autism Speaks hope to have all the genomes uploaded to Google’s cloud database by the end of 2015. Meanwhile, Google is at work on interfaces that will allow both researchers and families to search and analyze the data. If all goes to plan, said Wright, who co-founded Autism Speaks after his grandson was diagnosed with autism, the treatment outlook for autistic patients will look very different two years from today. To see the original article on cnbc.com click here. When Bobbie and Kyle Robinson’s son Samuel was born in 2012, both had good jobs and good insurance: She is a teacher and he is director of operations for a university basketball program. The future looked bright for the young, growing family, but everything changed the following year when Samuel was diagnosed with autism. The Robinsons learned their health insurance wouldn’t cover his treatment, which costs about $60,000 a year, leaving them scrambling to find the money. They took out a loan, borrowed heavily from their parents and held a fundraiser. Bobbie Robinson’s father even postponed his retirement to help with their medical bills. They managed to scrape up the money, but Bobbie Robinson was forced to go on medical leave so she could shuttle Samuel to therapy five days a week — a total of more than 300 miles. Kyle Robinson’s employer, the state of North Carolina, does not offer employee benefits that cover autism therapy, but a growing number of large private employers such as American Express Co., Capital One Financial Corp., JPMorgan Chase & Co. and United Technologies Corp. are extending their health plans to include comprehensive coverage for autism. With 1 in 68 children receiving a diagnosis of autism spectrum disorder, according to the U.S. Centers for Disease Control and Prevention, the number of autistic children has grown dramatically in the past few decades. Not surprisingly, more employees are asking for benefits that cover autism treatment, said Lorri Unumb, vice president of state government affairs for Autism Speaks, an advocacy group based in New York. “There’s been a huge spike in the number of companies offering coverage,” she said. Sheattributes the increase in part to the growing number of states that are passing laws requiring insurers to cover autism treatment. Currently, 37 states have laws in place, according to Autism Speaks. Indiana was the first to pass autism insurance legislation in 2001. While most insurance plans cover someautism therapies, like speech, physical and occupational therapy, few fully funded plans offered by smaller employers cover appliedbehavioral analysis, or ABA therapy, which is one of the most effective — though costliest — treatments for autism. This is the treatment Samuel Robinson receives. While state laws don’t apply to self-funded insurance plans, large companies are stepping up voluntarily. Among large self-funded employers, 82 percent offer autism coverage, according to Mercer’s 2013 National Survey of Employer-Sponsored Health Plans. In January, JPMorgan Chase began offering autism benefits through its health plan, covering intensive behavior therapy, such as the costly ABA therapy. The Robinsons may get some relief as well if the North Carolina state Senate approves a pending bill requiring insurers to cover the diagnosis and treatment of autism spectrum disorder. The bill would cover screening,diagnosis and a variety of therapies including applied behavioral analysis, which would be covered up to $36,000 a year. To read the original article, visit the link below. Gus: “Siri, will you marry me? To read the original article, visit the New York Times at the link below. Extraordinary superpowers, high-flying villains and fearless, world-saving heroes are the stuff of countless comic books. But the newest star to hit the comic circuit is different than most. Michael is a comic book character with autism – a hero with a mathematical mind, artistic gift and an abundance of compassion. Face Value Comics says he is the first hero with the disorder among comic books. The creator of the series, Dave Kot, hopes his books can help people on the autism spectrum better understand the world around them. That’s why Kot and illustrator Sky Owens made sure Michael and the other comic book characters are drawn with vivid facial expressions, in order to provide a kind of playbook for those who struggle with social cues. “One of [Michael’s] greatest powers and abilities is his own understanding of his emotions,” Kot said. 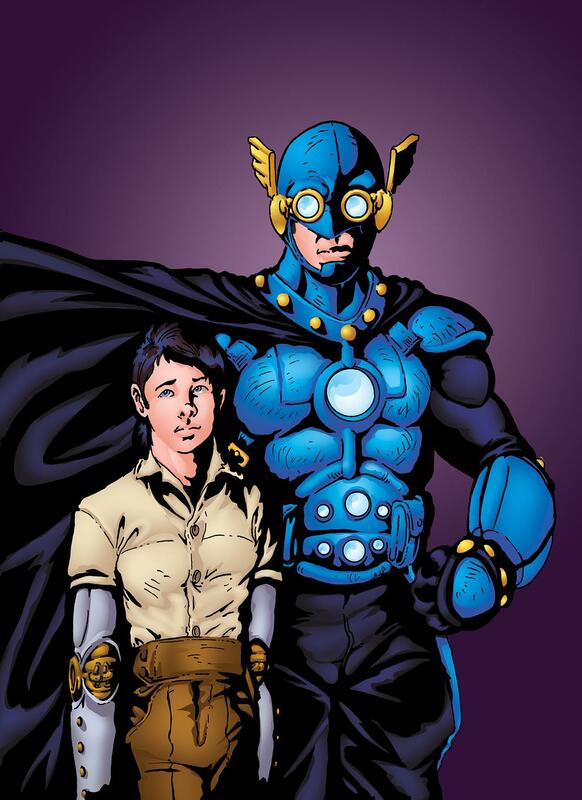 The comic books are resonating with people in the autistic community everywhere, helping kids like Brian Rasmuson understand they’re not alone. To read the original article published on NBC’s website, visit the link below.